Hi beauties, you already know my passion for Jumpsuits, they are feminine, fit perfectly and I never stop buying them. Today I share with you a new pretty one in white colour with embroidery and lace which I loved at the first time when I saw it at Zara's New Collection. Hola guap@s, sabéis que adoro los monos, me parecen muy femeninos y suelen sentar muy bien, así que nunca me canso de añadir nuevas adquisiciones a mi armario. Hoy os traigo un look con un mono short precioso blanco con bordados y puntilla que me encantó cuando lo vi en la Nueva Colección de Zara. This is a summery and relaxed outfit perfect for this Valencian summer. Lots of Love and thanks so much for your nice comments. Kisses!! Un outfit veraniego y cómodo que viene genial para seguir aguantando el verano que se resiste a marchar por Valencia. Muchísimas gracias por todos vuestros comentarios. Un besazo muy fuerte. ¡¡Muacks!! Hello dear you have a great blog! I love this outfit, especialy sunglasses and sandals! If you want we can follow each other with G+, GFC, Instagram, Facebook? Feel free to follow me, then write a comment on my blog and I'll follow you back! que bien te sienta el blanco! 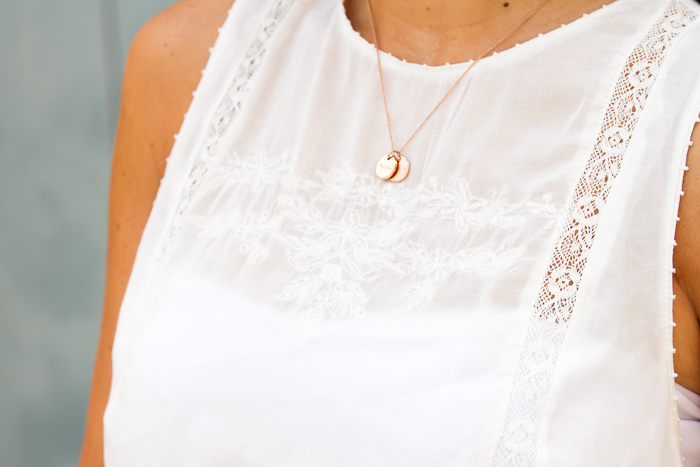 Totally in love with this outfit and little details as your necklace! I'm in love with your sandals!!! Que bonito!! Me encanta el color blanco. Bello questo look, mi piace molto il bianco, Gli occhiali sono molto carini. love every little detail here, the bag is superb! Precioso look, me encanta todo. Estás guapísima!!! un mono precioso!Me encantan los looks en blanco.Besos! me encanta el mono, tiene unos detalles increibles!!! Great photos, keep it up.. Check out my blog in return and don't hesitate to post some comments! Me encanta el mono pero las sandalias maaaas ! Nos ha encantado el mono! A bike on my shirt. The romper is pretty. It is great that you can still wear it. It has cooled off significantly where I live so summer will be departing very soon. I love this delicate outfit, white suits you well!